Welcome to the JUNGLE!! | That's Knotty! Silly me, I decided to start this blog while on vacation, so this is my first chance to post some photos. 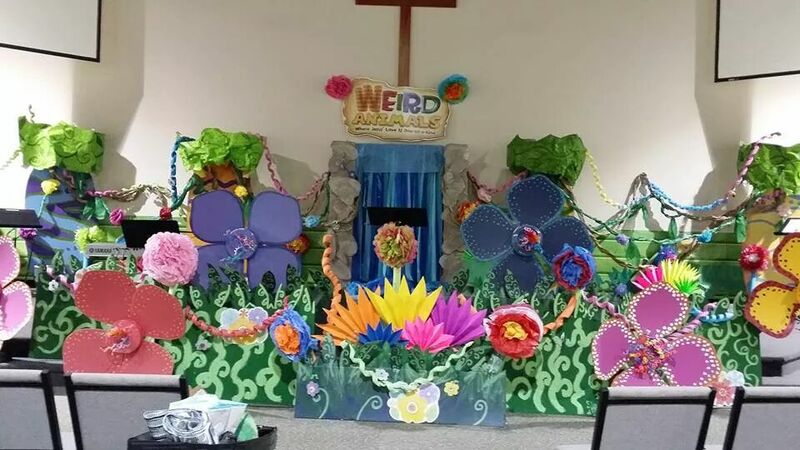 While on vacation in beautiful Ball Ground, Georgia visiting family, and we have spent the last week or so setting up for the Weird Animals vacation bible school at the church. I have to brag a little bit and say, the decorations came out AMAZING!! This is just the main stage. We also have an underwater room and a jungle themed room. 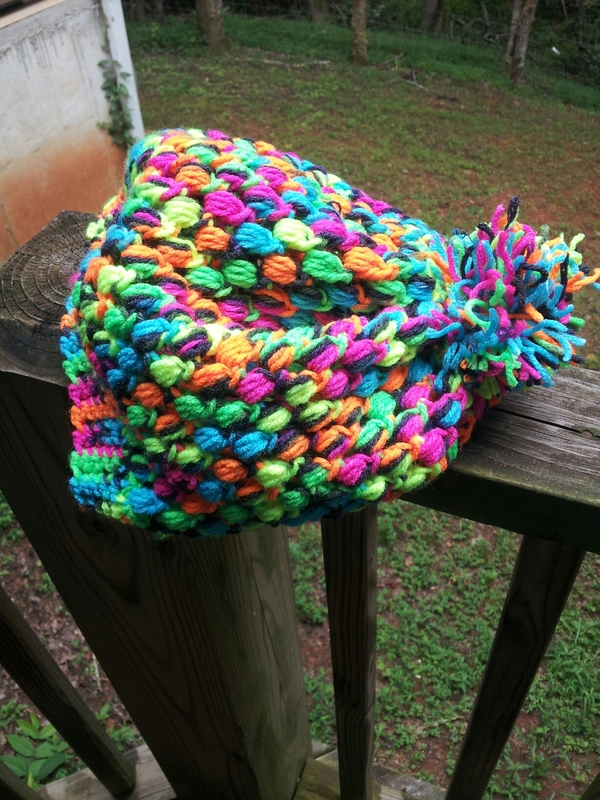 Anyway, my step mom asked if I could make a wild, funky hat for her to wear, since she’s the one running vacation bible school this year. So we went to Walmart and got some Red Heart Super Saver yarn in “Blacklight” (and it was even on clearance!) Then I went to Pinterest looking for an awesome pattern. 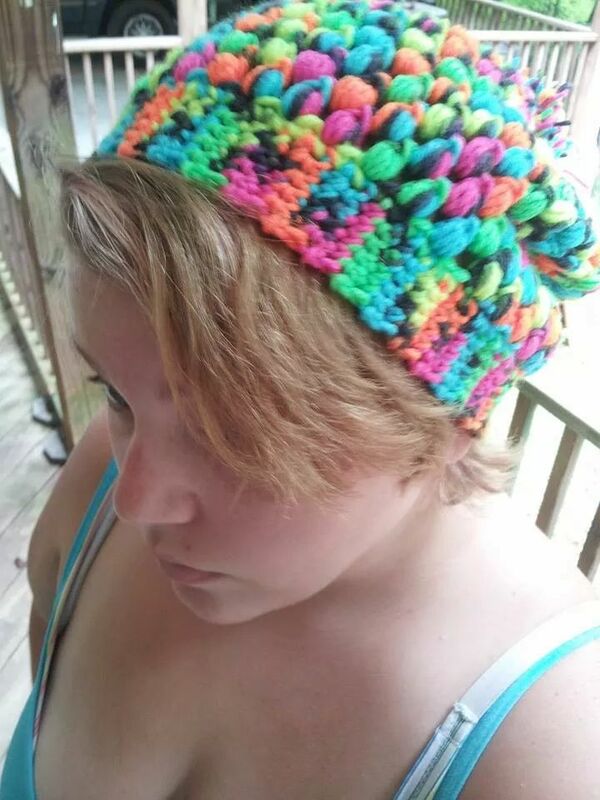 I ultimately ended up using Vickie Howell’s Urban Jungle slouchy beanie pattern, which I thought was fitting for our jungle/animal theme. I modified the pattern a little, deciding not to make the band ribbed, and I used a larger K hook instead of the H hook that the pattern called for. 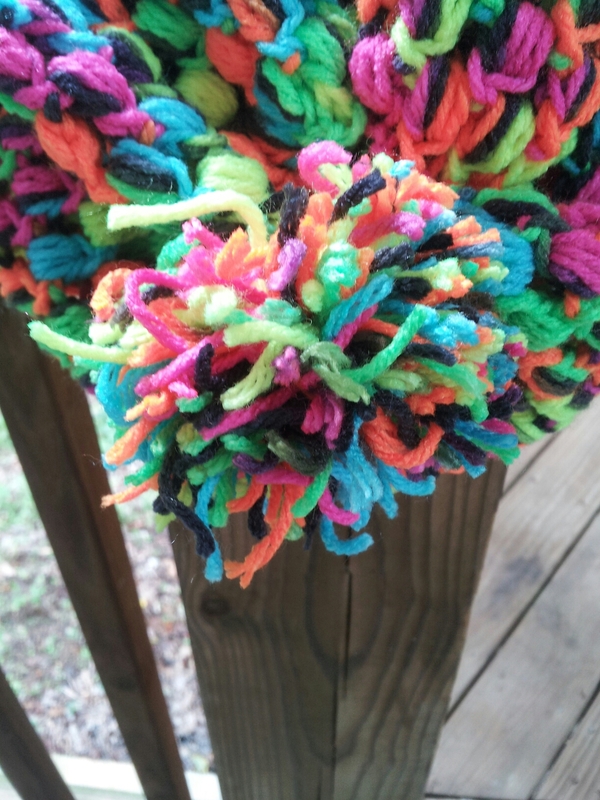 I started running out of yarn, so I ended up with 13 rounds instead of the 16 in the original pattern, and used the leftover to make this cool, uneven pom pom. 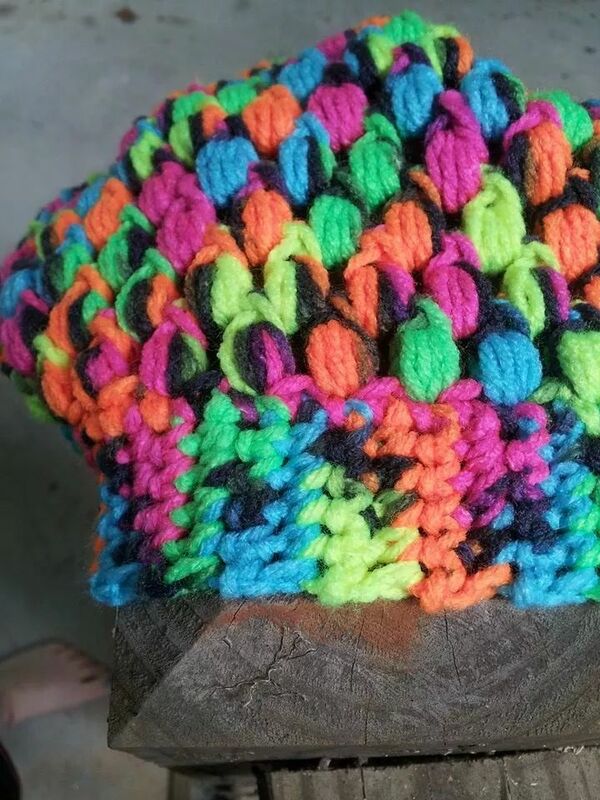 I have to say, I was a little skeptical of all the different colors in this yarn working with this pattern, but I believe it came out awesome!! 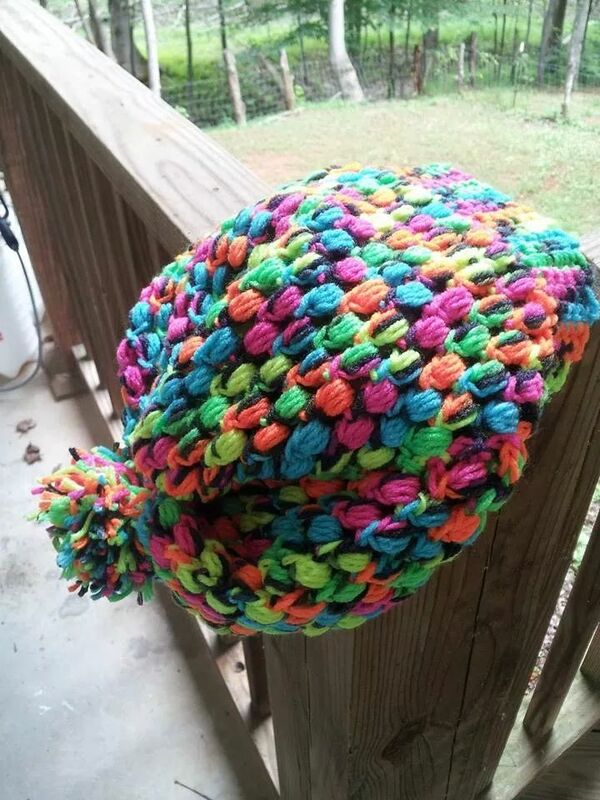 Here’s another shot of the full hat, with the pom pom. It’s so bright and cheerful! So that’s been my wild and colorful last few days, now we’re off to show it to the kids for them to enjoy, just as I hope you’ve enjoyed these photos! Until next time, grab a hook, pick some wild and crazy yarn, and get a little KNOTTY!